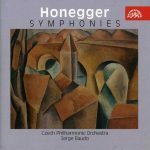 I like the music of Honegger, and I see many similarities with Shostakovich’s. Both are stylistically what I would characterize as “mild 20th-century modernists”, e.g. they wrote music that, in their time, was certainly far from the avant-garde (although they both were closer to it in their early days), but not entirely “romantic-reactionary” either. Both wrote music based on rather simple effects and appealing to basic emotions, oftentime close to film music (and both were active as film composers), but their effects are effective and appealing. I’m not surprised then that they held each other in high esteem – Shostakovich even transcribed Honegger’s Symphony Liturgique for 4-hand piano. But then, by the same token, I don’t understand why Shostakovich enjoys so much vogue and popularity these days while Honegger is so out-of-vogue and even looked down upon in some quarters. 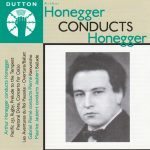 But there’s a further irony, or mystery, to the relation between Honegger and my life as a reviewer on Amazon.com. As I was transferring some of those reviews over here, I was reminded that it was not only a Honegger review that got me so pissed at Amazon.com that it determined me to get out of that website, it is also, more than a decade earlier, another Honegger review that prompted me to come over to Amazon.com and post my reviews there. See that story at the end of my February 1, 2018 blog post. So Honegger closes the circle that he opened. Arthur, what is your ghost trying to tell me? An incredible document: the earliest recording of Pacific 231, made, apparently, in February 1925… and not quite what you expect. See my review of this “mystery-Pacific“. 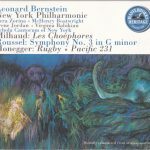 Piero Coppola’s were the first orchestral recording of Pacific 231 and the very first of Rugby (aka Mouvement Symphonique No. 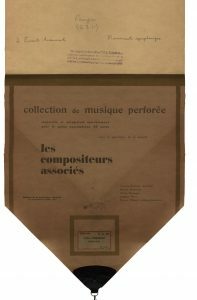 1 & 2), with the “Grand Orchestre Symphonique du Gramophone”, respectively from 16 November 1927 and 4 March 1929. 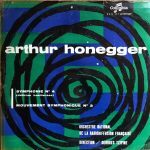 Honegger’s own orchestral recording of the same pieces are variously dated, either “1929” or 13 March 1930. Gratitude to the now defunct Dante to have reissued Coppola’s recordings on their Collection Piero Coppola dirige vol. 3 – La Musique Française du XXème Siècle, Dante Lys 373 (1998). 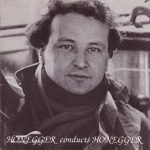 The best collection of “Honegger conducts Honegger” is the one published in 1993 by Music & Arts, CD-767, with La Tempête-Prélude, Pastorale d’été, Pacific 231, Rugby, Overture and Ballet from Les Aventures du Roi Pausole (rec. 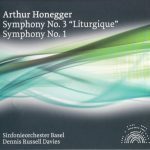 1929-30), Symphonie Liturgique (rec. circa 1947), and Le Chant de Nigamon conducted by Rhené-Bâton (rec. 1929). 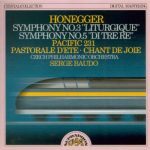 The one published on Alpha 802 in 2008, which shares with the former Pacific, Rugby and Symphony Liturgique but adds songs in complement, is also very attractive, though slightly less coherent. I’m happy to keep both, despite the duplications. In regard, Dutton CDBP 9764 (2006) is less coherent, as Honegger shares the bill with Maurice Jaubert and Gabriel Pierné. 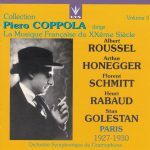 From Music & Arts’ program it lacks the formidable Symphonie Liturgique, but adds the beautiful Cello Concerto, played superbly in 1946 by its dedicatee Maurice Maréchal under the composer’s baton. 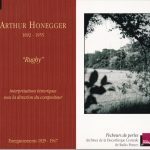 But the same piece can be found on EMI’s “Composers-in-Person” CD devoted to Honegger and Poulenc, EMI 5 55036 2, barcode 724355503626 (also with Pastorale d’été). I haven’t reviewed it yet because of the Poulenc part, but EMI’s transfer of the Honegger pieces seems more accurately pitched than Dutton’s. 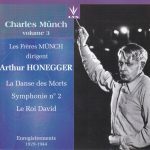 In 1941 and 1942 in occupied France, Charles Munch, one of the composer’s great champions, made two essential premiere recordings of recent Honegger works (both commissioned and premiered by Paul Sacher): the oratorio La Danse des Morts and the Second Symphony for strings and trumpet. They can be found paired together on Dante Lys 292, vol. 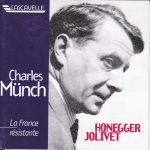 3 of their Charles Munch collection (1998) (with excerpts from Le Roi David conducted by Charles’ brother, Fritz Munch), and on Cascavelle Vel 3060, “La France résistante” (2005) (with André Jolivet’s Les Trois Complaintes du Soldat sung by Pierre Bernac, a recording also reissued by Dante on another CD, Dante Lys 514 – I also list other editions). 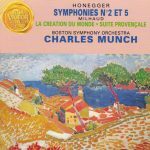 Great recordings, although Munch bettered himself both sonically and interpretively in his subsequent recordings of the Symphony. La Danse des Morts benefits from the total commitment of all those involved, and even more from the hallucinated rendering by speaker Jean-Louis Barrault. But the sonics are really limited and there are cuts. Munch performed it live in Boston in December 1952, uncut, a recording issued by West Hill Radio Archives, WHRA 6015: it is uncut, in much better sonics, and speaker Arnold Moss is not quite as impressive as Barrault, but not far. This alone warrants the purchase of the complete set, and confines the older recording to the collections of only the diehard Honeggerites (or Munchites). In 1952 and 1953, early in his tenure as music director of the Boston Symphony Orchestra, Munch made essential recordings of Symphony No. 2 & Symphony No. 5, now paired on RCA GD60685 (Europe) / 09026-60685-2 (US) with Milhaud’s Suite provençale and La Création du Monde (1991). Great versions, uniquely (but, for the conductor, typically) fiery and coming in fine sound that you could almost confuse for stereo, they remain entirely valid today and make this an indispensable historical recording. I also list the Japanese editions. 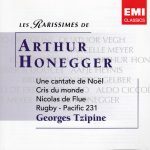 From 1953 to 1957, Georges Tzipine, back then a great champion of the composer, made a number of recordings of Honegger’s music, some of which that have been gathered on the twofer Les Rarissimes de Arthur Honegger: Une Cantate de Noël, Cris du Monde, Nicolas de Flue, Rugby, Pacific 231, EMI 5 86477 2 (2005). Despite the rarity of some of the repertoire and the historical significance of those recordings, the sound is undistinguished, the production somewhat slapdash and there are no texts or even synopsises – best reserved to the hardline collectors (and only if they don’t have the original LPs). Lamentable that Tzipine’s recordings of Symphonies Nos. 3 & 4 and Mouvement Symphonique No. 3 haven’t been reissued to CD. Move to September 1954 with Hermann Scherchen‘s recordings (with the Royal Philharmonic) of the three Mouvements Symphoniques (Pacific, Rugby, Mouvement No. 3), Prelude to the Tempest, Pastorale d’été and Chant de Joie, paired with Stravinsky’s Petrouchka on Westminster 289 471 245-2 (2001) (I also list the Japanese CD editions). 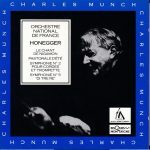 The sonic improvement over Honegger’s 78rpm recordings is striking (and Westminster’s mono sometimes sounds almost like stereo), and as you can expect of maverick Scherchen, the interpretations are unique, and they are, in Pacific but even more in Rugby, Mouvement symphonique No. 3 and Prelude to the Tempest, unequalled in their raging fury, before or since. On 11 September 1956, Munch gave a live performance of Symphony Liturgique in Prague with the Boston Symphony Orchestra, which was released on Multisonic 31 0025-2 in 1990 (Japanese edition 1991 EMI Vltava Classics TOCE-6943). 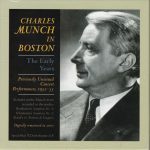 It is an essential addition to the discographies of both the conductor and conductor, as Munch (although the work’s dedicatee and premiere performer) never recorded it commercially, and for 25 years it was the only live to have surfaced (Yves-St-Laurent from Quebec has issued two more, one from New York in December 1947 and one from April 1956 in Boston, both of which I haven’t heard). 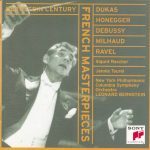 Igor Markevitch’s 5th Symphony, recorded in Paris in March 1957 with Orchestre Lamoureux for DG-France, would have been a great version, very close in spirit and interpretive choices to Munch’s premiere recording with the BSO in the first two movements and even slightly more urgent than him in the Finale, if it hadn’t been marred by DG’s antiquated sonics that let some important instrumental details get burried and deprives the grim and aggressive Finale of much impact. 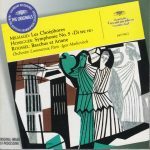 It was generously paired on the original LP with Milhaud’s Les Choéphores, to which the CD reissue on DG “The Originals” has added Roussel’s Bacchus et Ariane Suite No. 2. Munch returned to Prague in May 1957, but now to conduct the Czech Philharmonic Orchestra in the Second Symhony. It’s been released in 1990 on Multisonic 31 0022-2 (paired with Milhaud’s Music for Prague and 10th Symphony). 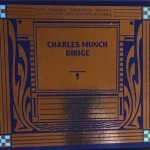 It is possibly Munch’s most furious and intense version, and the orchestra responds formidably, although the harsh sonics and audience noises inherent to a live performance don’t make it a first choice. Japanese edition on EMI Vltava Classics TOCE-6947 (1991). 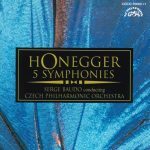 Serge Baudo‘s complete recording of the Symphonies with the Czech Philharmonic Orchestra for Supraphon began in 1960 with Symphonies Nos. 2 & 3, continued in 1963 with Symphony No. 5 and the three tone poems Pacific 231, Pastorale d’été and Chant de joie and was belatedly completed in 1973 with the two remaining symphonies. 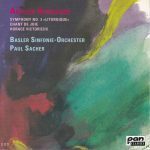 It was and remains an important set, and not only because it was the first (Munch and Ansermet never recorded the complete symphonies commercially, and even by 1974 Baudo’s First Symphony may have been a recording premiere). Even if better performances can be found of individual symphonies (but it often hangs on small details), interpretively Baudo’s traversal remains, to this day, as a whole, the best, better than the subsequent ones of Plasson, Dutoit or Luisi. Unfortunately there are sonic issues with the transfers of, respectively, Symphony No. 1 and Symphony No. 4 on the Western reissue, Supraphon 11 1566-2, and the Japanese reissue on Supraphon coco-70660-1. 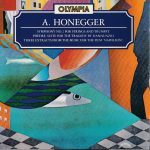 Ernest Ansermet‘s complete stereo Honegger recordings were finally reissued together in 2012 on a 3-CD set by the indispensable Australian Eloquence, 480 2316, with the substantial bonus of Frank Martin’s In Terra Pax (I also list all – I hope – the other CD editions, previous and subsequent, including those from Japan). They were recorded in 1961 (Christmas Cantata and Symphony No. 2), 1963 (Pacific 231 and In Terra Pax) and 1968 (Symphonies Nos. 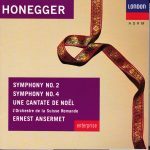 3 & 4), the latter among Ansermet’s last recording sessions before his death in February 1969. As one of the composer’s other great champions, the Ansermet’s recordings are of great significance. That said, they are not always unqualified successes. I can’t comment now on King David pending thorough comparative listening, but Ansermet’s Christmas Cantata remains arguably still today the best version, for many reasons which include his wonderful baritone Pierre Mollet (who had recorded it some ten years earlier with Tzipine, but not as effectively). His 4th Symphony is also excellent and stands out for his close observance of the score’s tempi and subtle tempo relationships. 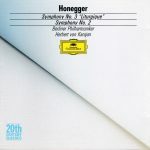 But both his 2nd and 3rd Symphony stumble on their sluggish and tensionless first movement (but the Finale of Liturgique, also taken at a reined-in tempo (but not as deliberate as Karajan’s the year after), develops a fine sense of implacability. 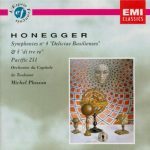 Pacific 231 has the momentum… but little else: not the weight, not the orchestral virtuosity, not the sonics that would give presence and impact to all the instrumental details of Honegger’s dense orchestration. 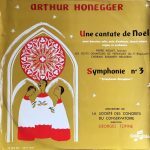 The set remains indispensable to the serious Honeggerite (and/or fan of Frank Martin), but those “only” interested in having great versions should go to the earlier Decca / London “entreprise” 430 350-2 (1991) with the Christmas Cantata and Symphonies Nos. 2 & 4. In 1987, Disques Montaigne published one of those lavish sets devoted to live concerts given by Orchestre National at Théâtre des Champs Elysées, vol. 3, TCE 8730, which included a concert given by Munch on June 5, 1962, with Honegger’s First Symphony and Dutilleux’ Second Symphony “Le Double” (the set also included works of Debussy and Roussel). 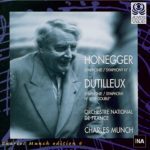 While Munch later made a studio recording of Dutilleux’ Symphony (Orchestre Lamoureux, 1965, Erato), this is the only testimony of his that has so far surfaced in Honegger’s First Symphony, and it, with Multisonic’s 1956 live performance of Liturgique (see above), it closes the circle and gives us full documentation of Munch in the five symphonies. 1998 reissue on Valois V-4830. I cringe when I read reviews claiming that a given recording is “the best ever”, when it is clear that reviewer has heard no more than a few others, if even that many. But I’ve heard quite a few recordings of Pacific 231 and Rugby, and in October 1962, Leonard Bernstein made what are arguably the best-ever recordings of these two pieces. These versions combine propulsion (and that’s a value that went lost after Lenny), stupendous sonics and stupendous virtuosity from the orchestra. They are on Sony’s Masterworks Heritage MHK 62352 (1996) with Milhaud’s Les Choéphores and Roussel’s 3rd Symphony, and also on Sony’s “Bernstein Century” SMK 60695 (“20th-Century French Masterpieces”, 1998) with Pastorale d’été. In 1962 and 1964, Munch made live recordings with Orchestre National of Symphonies Nos. 2 & 5, Pastorale d’été and Le Chant de Nigamon. They were issued to CD in 1989 by Disques Montaigne, MUN 2051 and reissued in 1998 by Valois, V-4831. 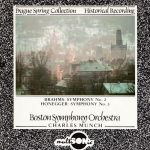 Great performances, with the added excitement of the live concert, more flexibility of tempo also than in Munch’s studio recording of the symphonies in Boston from a decade earlier, and, for the two tone poems, essential additions to Munch’s discography, since he never recorded them in the studio. On February 28, 1965, Yevgeny Mravinsky gave a live performance of Symphony liturgique which remains one of the most extraordinary versions ever recorded. What makes it so is its unparalleled level of intensity, fire, wrath, relentless anger, joined with (and abetted by) the vivid sonics and the very crudeness and brutality of the Soviet brass. Maybe the tragedies of 20th Century Soviet Union taught Mravinsky a thing or two about wrath, hate, destruction, enslavement, anger. It’s been reissued on many CD editions from or licensed from Melodiya, and I think I list them all. 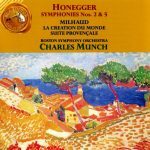 Great recording of the Second Symphony by Munch with Orchestre de Paris, an orchestra which he had just established at the request of the French government, made on December 28, 1967, his testament in a work that he conducted so many times since the French premiere in 1942, and one of his last recordings (he died of a heart attack on November 6, 1968, while on tour in the USA with the orchestra). Not as fiery as his previous recordings, studio or live (but still fierier than every one else), but benefiting from EMI’s great stereo sonics, and for that reason, Munch’s version to recommend if you have only one. I list many, if not all, CD editions, Western and Japanese. 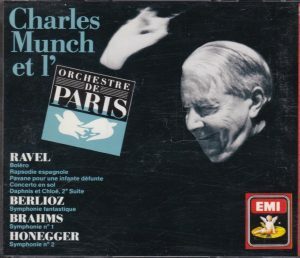 The one I have is the first CD edition from 1988, EMI CMS 7 69957 2, a very attractive 4-CD set with all of Munch’s recordings with Orchestre de Paris. The easiest available in the West in the 2001 reissue on EMI’s “Great Recordings of the Century” EMI 5 67595 2 or 5 67597 2. Karajan‘s famed recordings, from 1969, of Symphonies Nos. 2 & 3, first CD edition 1988 DG “20th Century Classics” 423 242-2, reissue 1995 on “The Originals” 447 435-2 (with the complement of Stravinsky’s Concerto in D for strings). Very idiosyncratic readings, but ultimately great versions, despite a few reservations. I also list the Japanese editions. 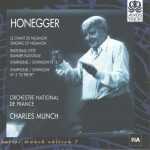 Jean Martinon‘s Honegger – Pacific 231, Rugby, Pastorale d’été, Une Cantate de Noël with Camille Mauranne, recorded with Orchestre National de l’O.R.T.F in 1971 – isnt as convincing, I find. First CD edition EMI “L’Esprit français” CDM 7 63944 2 (1991) and reissues, including Japanese. 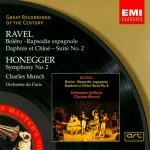 Michel Plasson‘s survey of the complete symphonies on EMI (“Gemini” 5 85516-2), recorded from October 1977 to February 1979, is an uneven cycle: great First (possibly overall the best among the rare recordings of that work) and Second (but beware: it is the only version I know that does without the ad libitum trumpet in the Finale, which may be both an attraction and a detriment), a fine Liturgique, but very flawed 4th and 5th. The good news is that you can find 1-3 on a single CD, “L’Esprit Français” 7 64274-2. 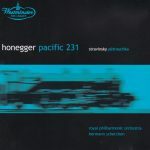 His Pacific 231 lets you hear many felicitous orchestral details, but never gains much momentum. I also list the Japanese editions. 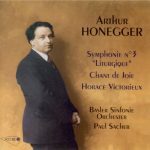 As one of the great champions of Honegger, and, even more important, commissioner of many of his greatest works (Symphonies 2 to 4, Concerto da camera, La Danse des Morts, A Christmas Cantata), any recording of Paul Sacher conducting the composer is significant. 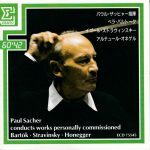 Unfortunately, his interpretation of the Second Symphony for strings, made in 1985 for Erato and CD-reissued in 1989 on Erato – Japan ECD 75545, while very faithful to the composer’s metronome marks (and, in the Finale, because of it), is one of the most tensionless I’ve ever heard. 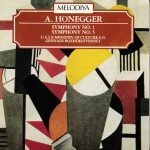 The pairing on Melodiya MCD 154 (a recording produced under licence by the English label Olympia) of Honegger’s first and last offering in the genre is an excellent idea, not otherwise encountered on disc, with the 5th recapturing something of the grimness and aggressiveness of the First (and it is probably coincidental, but very appropriate, that the 5th ends with the same character indication, “Allegro marcato”, as the First begins). 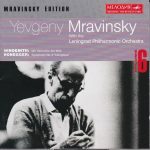 Gennadi Rozhdestvensky, recorded in 1985 and 1986, offers VERY idiosyncratic readings of both works, marked by VERY slow tempos, which may rob the first movement of Symphony No. 1 of some of its furious drive, but the conductor makes up for the sluggishness of his pacing thanks to the remarkable bite of all his players and especially brass and woodwinds, abetted by the extraordinary sonics which place you right in the middle of the orchestra – and nearer to the back and brass. This is by far the version with the most potent instrumental impact, and the music easily makes up in huge power what it may lose in sheer drive. Not a first choice because too far out and personal, but, for the very same reason, a CD hat no serious Honeggerite should be without. As in his recording of Honegger’s Symphonies Nos. 1 & 5, Rozhdestvensky, recorded in 1986, offers here, on Olympia OCD or Melodiya MCD 212, a very idiosyncratic, deeply personal reading of Symphony No. 2, like no one else’s, but one that I find entirely convincing. Except for the “molto moderato” introduction, which he takes at a rather flowing pace in the manner of Munch, his intepretation is marked by very deliberate tempos, but with any sense of sluggishness offset by the powerful vigor of the bows’ attacks on the strings, abetted again by Melodiya’s stupendous 1986 sonics. 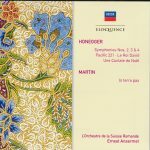 The suite for d’Annunzio’s Phèdre offers a great complement, Honegger at his most modernist, angular dissonant, and Rozhdestvensky again performs it with drive and bite. 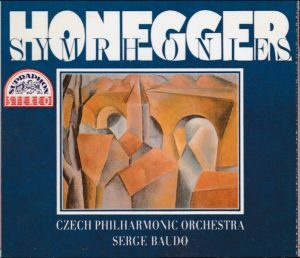 It is only the three excerpts from Honegger’s music for Abel Gance’s ill-fated film Napoleon that are disappointing, not just because they are not the most interesting excerpts from that music (go to Adriano on Marco Polo), but also because here Rozhdestvensky is very sluggish. Also, that part has been dubbed directly from an LP, surface noise and all, it’s senseless. But Symphony No. 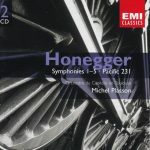 2 and Phèdre are reason enough for the serious Honegger fan to buy this CD, again not as a first choice – too personal and idiosyncratic – but as a complement to more mainstream versions like those of Munch or Karajan. With Neeme Järvi being such a profuse conductor and tackling apparently just about any repertoire, from Weber, Berwald and Fibich to Ives, Barber and Tubin, you’d expect him to be truly at home with none, especially when it strays from the Romantic, preferably Russian or Baltic. 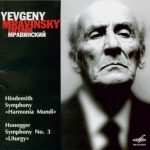 Yet in 1992 he recorded for Chandos (CHAN 9176) one of the best Liturgiques – very much in the urgent and breathless style of Mravinsky – and, truly, although I am very wary of that kind of pronouncement, THE best Symphony No. 5 ever (yes, I have heard most of them). Great sonics too, letting you hear all the details of Honegger’s dense orchestrations, and a superlative Danish Radio Symphony Orchestra. 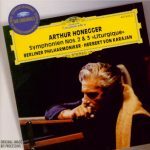 As one of the great champions of Honegger, and, even more important, commissioner of many of his greatest works…. Wait! I’ve said that already. Well, unfortunately again, Sacher’s interpretations of the once-popular Symphonie Liturgique and the rare symphonic poems Chant de Joie and Horace victorieux, with the Basel Symphony Orchestra in 1992 on Pan Classics 510 053 (reissued on Accord 203 022), are rarely special. 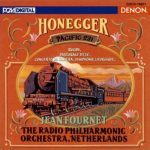 Jean Fournet isn’t a conductor much associated with Honegger, and in fact I’m not aware of any Honegger recording of his other than this Denon CD, recorded in 1993, with Rugby, Pacific 231, Concerto da Camera, Pastorale d’été and Symphony Liturgique. Also, you wouldn’t expect an 80-year old conductor to have the energy and drive to fully convey the tension, bite, motoric energy and even rage of the two “Mouvements symphoniques” and the Symphony. To an extent, this is verified: Fournet’s Rugby is the most sluggish committed to disc, rugby players mired in mud. His Pacific is much better, although it lacks momentum. Not surprisingly, the two more gentle pieces, Pastorale and Concerto da Camera, fare well and are very atmospheric. But it’s Fournet’s Liturgique that comes as a great surprise: while the first two movements seem modelled after Karajan’s recording and are not wanting in bite and tension, the Finale is truly something else: where the slowest versions, like Karajan’s, took that grim march at the very deliberate tempo prescribed in the score (many taking it significantly faster – including the composer -, to great effect, and no one I’ve heard taking it faster than Mariss Jansons), Fournet takes it almost 20 beats slower. Subjective reaction and judgment will differ: I find it great, and if only for its radicalism this is a version that every serious Honeggerite should know. By some serendipitous irony, Mariss Jansons recorded, the same month as Fournet (December 1993), on EMI CDC 5 55122 2, one of the great versions of Symphony Liturgique, and one with the most extreme, fastest Finale ever (his first movement is also, with Baudo’s, the fastest I’ve encountered). 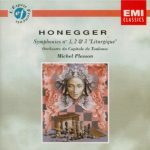 If you consider, as I do, that the serious music-lover should have at least three versions of any work in his library, a middle-ground and two extremes, Jansons’ Liturgique belongs, with Fournet’s, to the collection of any serious Honeggerite (I’m not sure who the middle-ground would be, because although they’ve been sent toward the center by Jansons and Fournet, Baudo, Mravinsky and Järvi on the one hand and Karajan on the other remain quite extreme in their own right). 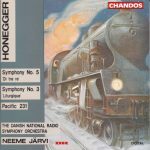 Jansons’ Second Symphony and Pacific 231 are not quite on the same plane and not entirely equal to the very best, but still excellent versions.